Now in its 13th year, the Bucharest International Jazz Competition has opened registration for 2019 and all jazz instrumentalists and vocalists, no older than 40, are invited to participate. Bucharest International Jazz Competition is one of the most appreciated jazz events, by specialists and the public, the event being ranked among the first 3 European jazz competitions. The total value of the prizes for 2019 is 7,000 Euro, of which 1,200 Euro are reserved for the Grand Prize Winner. 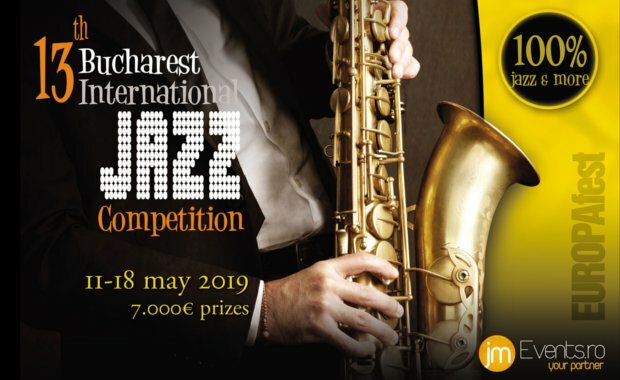 Between the 11th and 18th of May 2019, Bucharest International Jazz Competition celebrates its 13th edition. The competition takes place during the International Festival EUROPAfest. It promises unforgettable meetings, thrilled audience, atmosphere, by combining concerts with jam sessions, workshops and jazz master-classes. The winner is chosen by a jury composed of artists and teachers, personalities of the international jazz world. Over the years, the Bucharest International Jazz Competition has proved to be a promoter for jazz musicians and bands, not only in Eastern Europe but all over the world. Its mission is to contribute to the acknowledgment of jazz values and to celebrate creativity and freedom of expression. In 2018, 30 bands with musicians from 25 countries have participated. The registration fee for one application / jazz band is 120 Euro.